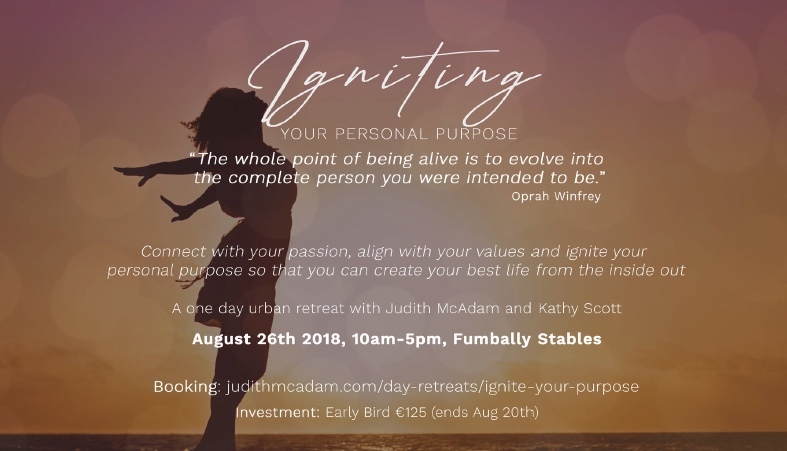 Home Tags Posts tagged with "visualisation"
Judith McAdam and Kathy Scott are leading a one-day urban retreat called Igniting Your Personal Purpose on Sunday August 26th, from 10.00 a.m. to 5.00. p.m. in the Fumbally Stables, Fumbally Lane, Dublin 8. This retreat aims to help you connect with your passion, align with your values and ignite your personal purpose so that you can create your best life from the inside out. Click here to learn more. Igniting Your Personal Purpose is a one-day urban retreat with Judith McAdam and Kathy Scott. It aims to help you connect with your passion, align with your values and ignite your personal purpose so that you can create your best life from the inside out. This is a special invitation to experience practices that include Meditation, Energy Alignment and Healing, Powerful Visualisation Techniques, Kundalini Yoga, Journaling and other gifts from the wisdom traditions. Judith McAdam, author of the acclaimed self-development book, The Source, is a mother, theologian, kinesiologist, life coach, course facilitator and inspirational speaker. During her recent Positive Night visit with us, she had many gems to share! Throughout her career, Judith has inspired people to tap into their unique creative intelligence and step into their true potential, realising their personal and higher purpose in this life. Judith weaves together the ancient and the new, by drawing on mystical theological traditions and connecting this information to contemporary psychology and science in an accessible and impactful way. Judith marries theory and twenty first century human experience specialising on issues around health, relationships, infertility, finance and career. She synthesises her knowledge to reveal the universal principles that unite us all, with the over-riding message that our greatest power lies within us – and if we harness that power we can deliberately create our own reality. Kathy Scott, meanwhile, is a creative producer, curator and strategist in the cultural arena. She is the Creative Director of The Trailblazery, the Ireland : Iceland project and Wonderlust at Body&Soul Festival, and is currently artist-in-residence at Trinity College Dublin. Kathy is passionate about creating and curating experiences that celebrate the human spirit. She has worked and played with a host of artists, collectives, activists and pioneers around the world to make cultural projects that animate the times we live in. She is dedicated to creating work that orients around our shared heart-centred qualities of courage, compassion and care. It certainly sounds like this workshop will be an incredible experience. To learn more and reserve your place, click here. The price is €125, with early bird prices available until August 20th. Just a reminder: it is taking place on Sunday August 26th, from 10.00 a.m. to 5.00 p.m. in the Fumbally Stables, Fumbally Lane, Dublin 8.